Although we haven't seen Million Dollar Arm yet, be aware that we may give away some potential spoilers. But if you've followed the story of Rinku Singh and Dinesh Patel, you might know some of what happens anyway. We don't mean to wreck anything for anyone, so if you're super-sensitive to heartwarming Disney movies that are based on true stories, proceed with caution. 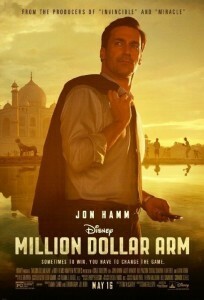 Although Million Dollar Arm focuses primarily on agent JB Bernstein, who is played by Mad Men's Jon Hamm, there wouldn't be much of a story if it weren't for Rinku Singh and Dinesh Patel. These are the two pitchers that signed with the Pittsburgh Pirates as a result of Bernstein's experiment. 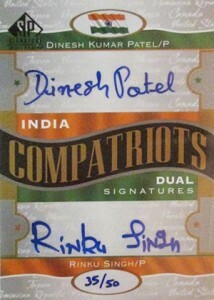 The novelty factor of the signings led to several card companies making Dinesh Patel and Rinku Singh cards. While none are likely to be worth much, the fact that they're being immortalized by a Hollywood movie will add a little interest -- at least for a short time. Here's a look at some of their better cards. 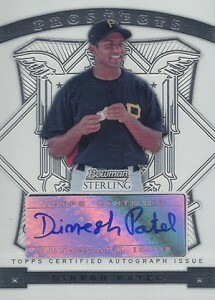 While no Rinku Singh card is going to ever be worth a lot, his 2009 Bowman Chrome autograph is his best card. Any value now is going to come from its connection to the film and the story behind it rather than his on-field accomplishments. Most, but not all, of the cards come inscribed with the number 18. There are also several Refractor parallels. 2009 Bowman Sterling has a more premium feel than Bowman Chrome. But then it also uses a sticker for the signature. Sterling doesn't have the same brand appeal as Chrome so this one is a little cheaper. 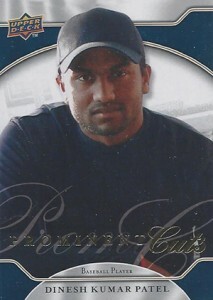 If you're not interested in an autograph, 2009 Upper Deck Prominent Cuts includes Singh on the base set checklist. However, with so many collectors ripping the product primarily for autographs, it's not the easiest card to find. 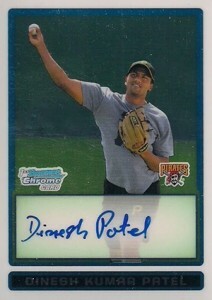 Like Singh, 2009 Bowman Chrome is the best card of Patel. It's highlighted by an on-card signature and the popularity of the Chrome brand. Bowman Sterling offers a lot of autographs. Unfortunately, they're not normally as highly sought after as their Bowman Chrome counterparts. 2009 Bowman Sterling also uses very noticeable foil stickers. Those looking for a challenge can chase several types of Refractors. The dark hat and generic shirt leave Patel looking like an umpire rather than a pitcher. Upper Deck didn't have a MLB license when Prominent Cuts was released, which resulted in the plain look. 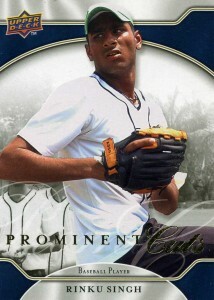 However, it's a quality choice for those who want a Patel card that isn't signed. Excluding parallels, Singh and Patel don't have a lot of cards to begin with. The 2009 Tristar Obak Mini is interesting in that it pairs the pitchers up. It's not the easiest card to find, but it's not rare either. 2009 Tristar Obak also has autographs of both players. Like the Obak Mini, this card is more about the novelty aspect of have both players on the same card than anything else. It's readily available and cheap. 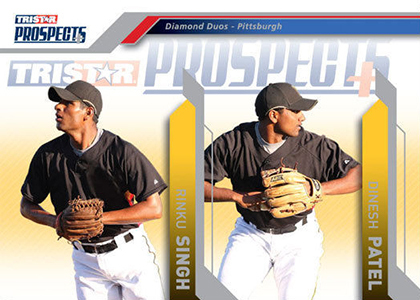 2012 SP Signature Edition might not have photos, but it does have a card with autographs from both Patel and Singh. Numbered to 50, copies don't surface very often. Outside of Dinesh Patel and Rinku Singh cards, there isn't a lot to collect that's connected to the film. Double-sided theatrical posters are probably the best option. Without cards of Mad Men or any of his films, the main collectible for Jon Hamm is signed photos. Aasif Mandvi, who has a fairly large role in the film, has an autograph card in 2007 Rittenhouse Spider-Man 3. Hall of Famer Barry Larkin and possible future Cooperstown inductee, Curt Schilling, also appear in the movie.